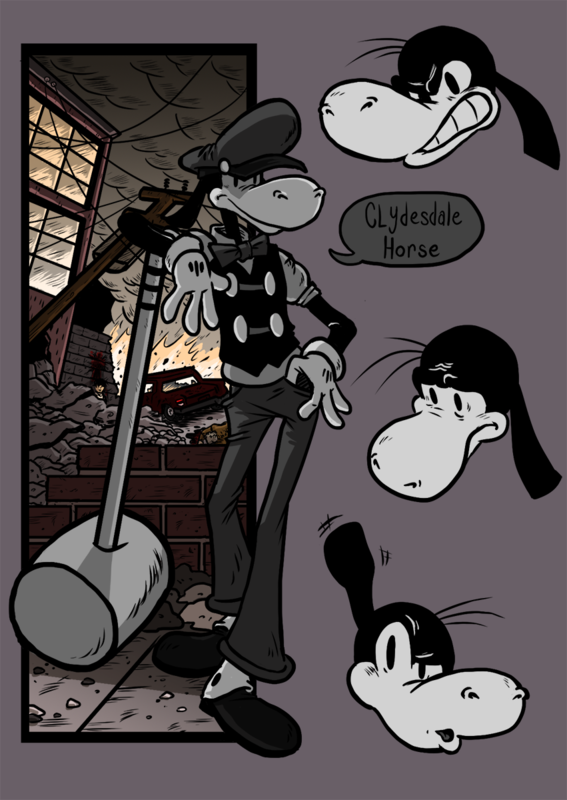 Clydesdale Horse was a Golden Age cartoon who one day broke his funny bone, and in doing so, realized the horrors of the world. All the hate, angst, and atrocities committed by man that just the day before had been the subject of his very own cartoon escapades. In his limited budding conscience and wisdom, he decided to use his powers to revolt and destroy the horrific civilization of the species called man; that routinely allowed and encouraged suffering and pain against his brothers and tear it down to nothing rather than subject its inhabitants to the whims of its corrupt and cruel leaders. Clydesdale is capable of everything that you've seen in the cartoons and adheres to the laws of cartoon physics. Through hammerspace he can obtain anything desired. Walking off of a building will allow him to float indefinitely so long as he doesn't look down. He can paint a tunnel to go through and anyone who follows will be hit with a train. He can be blown up, smashed, torn to shreds, and anything imaginable and come out perfectly fine in mere moments. In essence, he is a God. However, he is vulnerable to that which kills all cartoons.